A leaky vinyl deck is no joke, and without prompt attention can soon turn into a major problem for your home. So how do you locate the source of vinyl deck leaks in order to begin repairs? It may seem straightforward, but water can be wily – so finding where water is gaining access versus where you can see evidence of water accumulation may take all your sleuthing skills. Before you can do anything to stop and repair vinyl deck leaks, you first need to contain the damage it is causing. Typically, you want to start with a container that will catch water that’s dripping underneath, so it doesn’t damage flooring, carpet, etc. If water has already entered walls or flooring, you might need a restoration company’s help to properly dry out the area and assess damage. Unless there is an obvious point of ingress, this part of the task may require professional assistance. The reason being is that vinyl deck professionals have the necessary tools to perform non-invasive tests to find the source of the leak, without causing further damage to the vinyl deck surface. This is a benefit if a small repair can correct the issue, rather than creating the need for a full replacement of the vinyl deck surface. Seams: Any point where two seams join, or the vinyl deck surface joins with flashing or other surface, is a point that can fail and let in water. Door Installation: Vinyl surfaces should run under door jambs, not around them. If the latter is the case it could be your source. Drainage: Any time water gets backed up can provide a chance for it to work its way under the vinyl deck surface. Flashing: Should be intact, and any caulking is still holding up. Siding Coverage: Most building codes required that vinyl membrane passes under siding by 6 inches, otherwise water can work up and around the edging. There is also still the chance that your deck is not the source – for example, a leaky gutter could be letting water track down siding and inside, then down the face of your home and under the deck surface. But by checking the common culprits you can formulate a plan for repair. 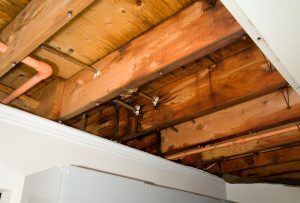 Identifying the source of a leak will give you a guide as to necessary repairs. Even if a full vinyl deck membrane replacement is not required, it may be a wise choice to ensure deck waterproofing for the years ahead. Your best course of action is to have a vinyl decking professional investigate your leak and provide options for long-term waterproofing protection.